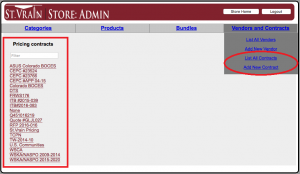 This post will detail the procedure for setting up an item so that it can be “purchased” from DTS on the SVVSD web store. The normal use case for the store has district schools and departments getting the information from the store in order to place an order via PO or PCard directly with the vendor. In some cases, it may make more sense to have one department have a stock of product so that it can act as a vendor to other schools and departments. DTS is the primary case of this, but it could apply to other departments as well. After a “purchase” is made, a finance system journal entry is made to transfer funds from the buying department to the selling department. Having the PO or PCard information from when the items were originally purchased allows this transfer to go smoothly through finance. The process below shows how that information can be made available. 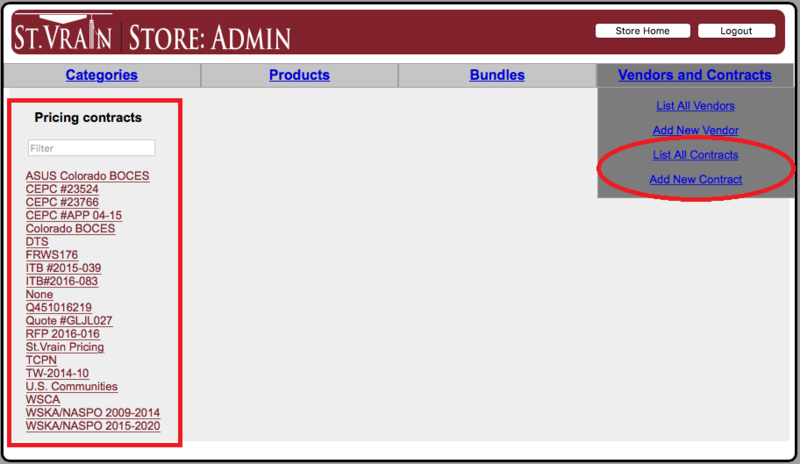 Login to the Admin section of the store and create a new “Pricing Contract”. 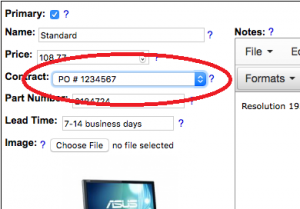 Alternately, find and edit an existing contract if you simply need to change the reference PO number. 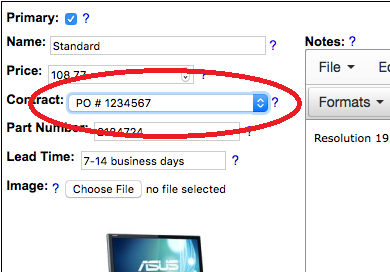 Name the contract with a reference PO number or appropriate PCard information. Set it with an expiration date far out in the future. Save the contract. When creating a new product or editing an existing product, set the contract to the contract you created or edit above. Save your changes. When the user adds product to their cart and selects “Build Orders”, the information is displayed near the appropriate product(s). This can also be useful for DTS personnel who receive requests for products without all the necessary purchase information; simply build a cart yourself on the store without even logging in.